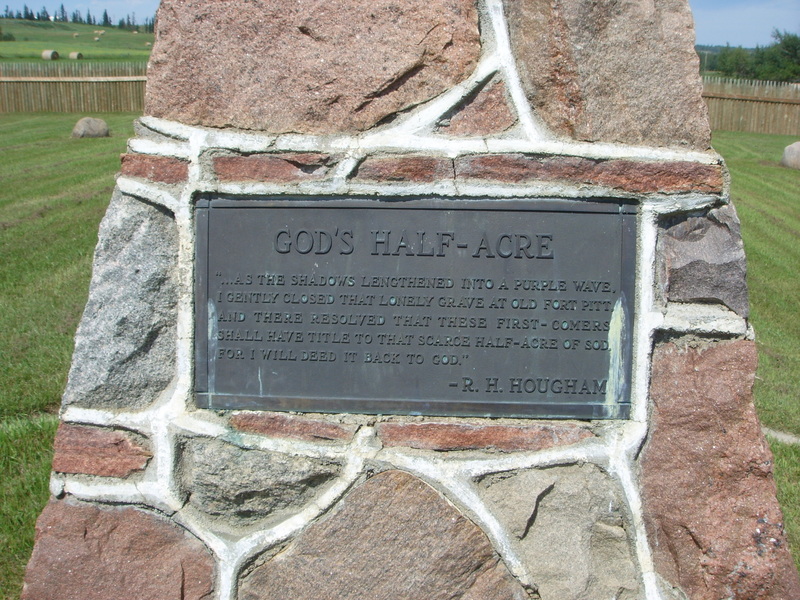 When Robert Hougham bought Fort Pitt from the Hudson’s Bay Company in 1944 and began breaking the land to grow hay for his cattle, he found human remains in unmarked shallow graves beside the site of the fort. So he gave half an acre to those remains and built a cairn. And he was buried there when he died in 1960. 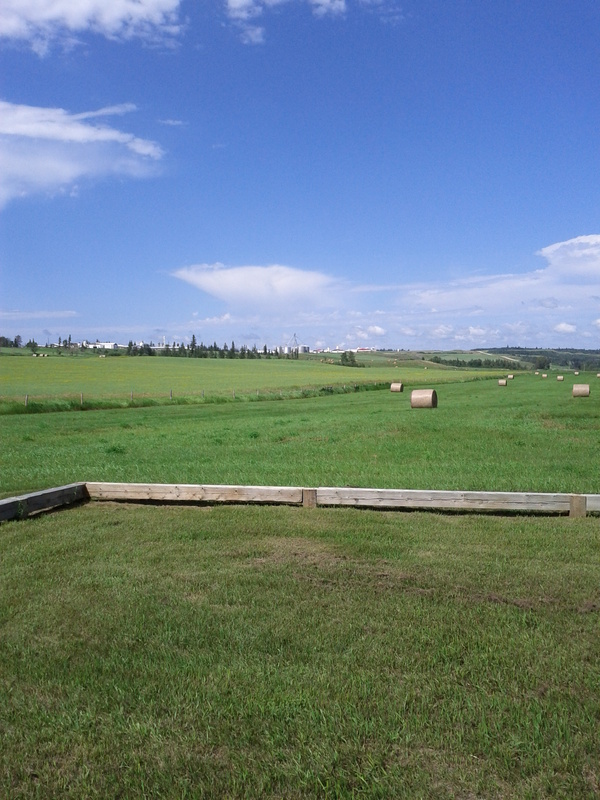 In the valley beyond is the North Saskatchewan River. They used electro-magnetic sensing equipment to piece out where the fort’s buildings once were (both forts, that is; there were two incarnations of it). Behind, to the north, is the rise over which Big Bear’s band came with their prisoners after the Frog Lake “Massacre.” At this point they were under the leadership of Wandering Spirit; in times of battle the war chief was in charge. On the rise now is a Hutterite farm; they made a new road that curves to the right, away from the fort, and eventually into the farmyard. It’s a big enough road for you to be surprised that it’s not on any of the maps. Treaty Six was signed here in September 1876. Big Bear came to Fort Pitt just after its signing and continued to refuse its terms: he wanted assurances that laws would be made to protect the buffalo, and he was suspicious of the government’s claim that it would keep its promises to his people if they made treaty. Everything that he was seeing on the reserves he visited indicated that living on one of them was no way to keep his people healthy, fed, or safe. So he tried to put together a group of like-minded chiefs to enter into meaningful negotiations with the government, while the younger, wilder, more war-oriented men in his band grew more and more frustrated by the rapid disappearance of the buffalo and with remaining peaceful while their way of life vanished. So, back to the spring of 1885: Big Bear and Wandering Spirit and their people and prisoners come over the rise and make camp, and Big Bear gets W.J. McLean, man in charge of the Company at Fort Pitt and a friend of Big Bear’s, to come out and talk with him. After the Frog Lake “Massacre,” everyone at the fort was prepared for a fight but no fight came. 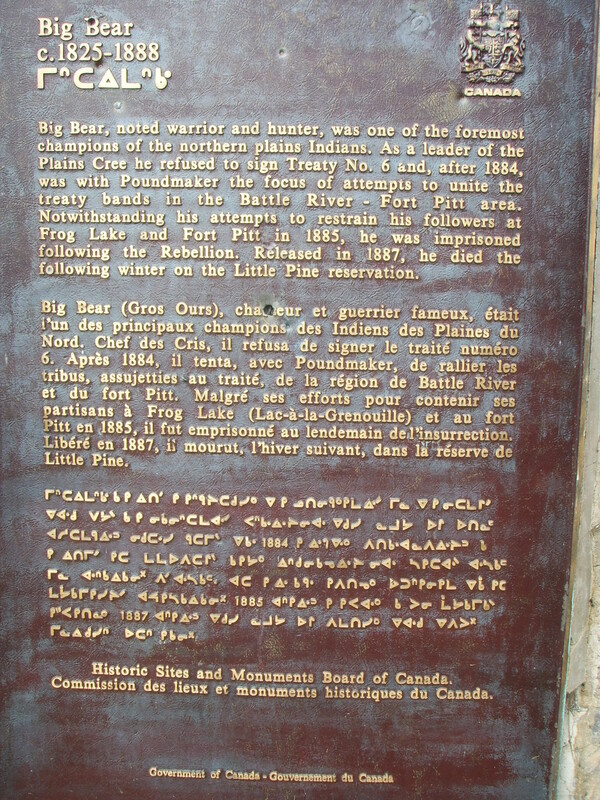 (Any reference to a “battle” at Fort Pitt refers to an incident where three Northwest Mounted Police stumbled into the middle of Big Bear’s camp by accident. Thinking that the presence of these three guys was a sign of a larger approaching front, members of the camp shot down the slowest of the retreating officers.) 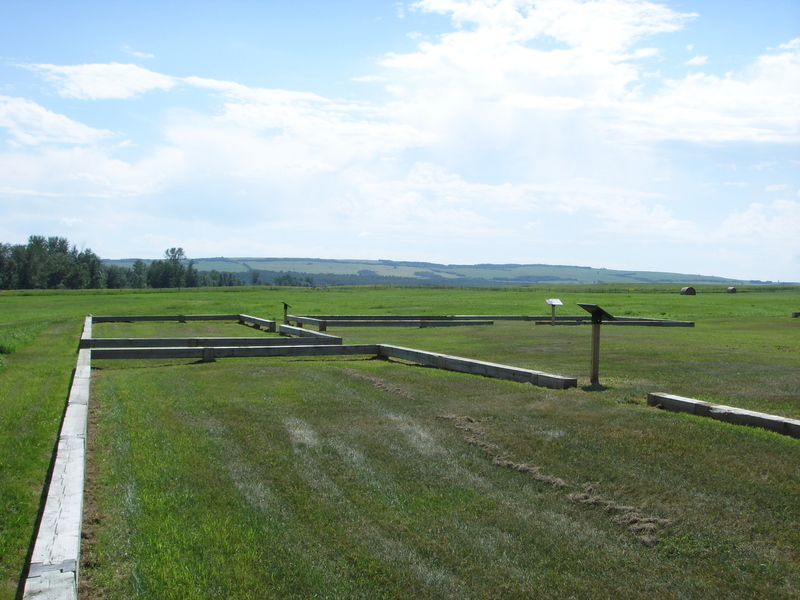 After a lengthy discussion, Big Bear and McLean agree to let the NWMP at Fort Pitt get away (led by Francis Dickens, son of one certain Charles) while they take all the civilians and Company folk at the fort into their camp as prisoners. They are now a very large, rather unwieldy party, and they will make their way, eventually, slowly, through snow and wet, to Frenchman Butte. Laurie, where was that of Big Bear plaque/monument located? Thank You, I found it on the same cairn, but on opposite side of the Fort Pitt plaque.